How do scientists work? How can we study things we can't even see? Beauty & Charm is an activity-based program for middle schoolers, which culminates in a field trip to Fermilab. Beauty & Charm provides students with authentic experiences using scientific practices and cross-cutting concepts from the Next Generation Science Standards. The program includes an instructional unit, a professional development workshop and a free docent-led field experience at Fermilab. Experience the Beauty and Charm curriculum as your students will! Master teachers lead the activities in the fifth edition of the Beauty & Charm manual and provide insight from experience with students. Participants will also experience the student field trip and a special driving tour of the Lab. "Loved all the labs and new ideas." "Instructors are very knowledgeable and professional, extremely organized and offered students many helpful suggestions; this is the BEST staff development class I have taken in 25 years of instructions." "I can't speak highly enough about this program or Fermilab; I will continue to stay as involved with Fermilab and/or its resources as much as possible, and spread the word to anyone and everyone who will listen!" Beauty and Charm is an engaging, exciting, exploratory physical science program in which students learn how scientists work, and how we can learn about things we can't see. Activites introduce your students to the world of particle physics, and to the concept of science as a process of constant, ongoing learning. "I took Beauty & Charm three years ago. I stop whatever I'm teaching approximately two weeks before we come here and we do some of the detector activities… It brings it down to a level that they really can understand and wrap their heads around, and I think that's important." After attending the workshop, teachers may bring students to Fermilab for free field trips every year. 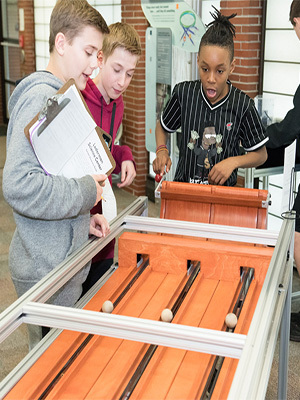 Students interact with the exhibits at the Lederman Science Center and tour Fermilab's Wilson Hall, visiting the Linear Accelerator and Main Control Room. Students also get to meet with a scientist or engineer working at Fermilab and have an opportunity to ask questions about his or her work. Use the Field Trip Request Form. "(Students) actually get to see that people are really doing science." "We had a wonderful time today. I had 4 Dads among the many chaperones that attended. This is one of the only field trips that I have Dads volunteer for. I know they all had a great time too. As usual, it always goes by much too fast. Our docents were really great and knowledgeable. There were lots of new activities at the Lederman Science Center and the students really enjoyed them. Of course the visit with the scientist was the highlight, as always!" "The scientist … was fabulous. We appreciated the fact that he did not 'talk down' to our students. As a result, we saw them blossom on their trip and really step outside their comfort zones, asking thought-provoking questions. Our 7th Grade students have been visiting Fermi for many years, and this year was particularly enjoyable. The docents were patient, knowledgeable, and pleasant. Thank you so much for a great experience." "I want them to hear about the philosophy of everyone being significant. That's important for them to understand, especially at this age; that they have a voice, that their ideas are important, and when they come here, it's the same message that I give them in the classroom."